If a product just isn't working out, you can cancel it to delete the product from your account. We'll send you a confirmation email you must answer, and when you reply we'll delete the product and its files. Note: If you want to cancel a domain and remove it from your account, see Cancel my domain. Select the product or products you want to cancel, and then click Cancel Renewal. When you receive our "Are you sure?" email, open it and click Yes, I Want to Delete! We'll take you back to your account. Click Delete product. We'll confirm that your product is deleted from the account. If you like, use the feedback box to let us know why you deleted the product. After you delete a product or service, you can find out if you're eligible for a refund by contacting customer support. 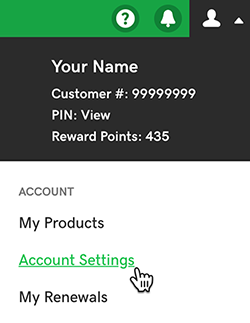 After you delete all your products, you can close your GoDaddy account. Warning: No refunds after you close your account. If you're eligible for a refund, please contact our support team directly to request a refund before you close your account. Once your account is closed, your account data is deleted and you will no longer be eligible for a refund as otherwise permitted under our refund policy. 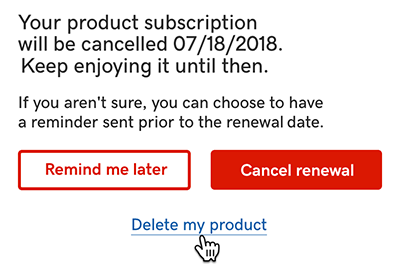 If you cancel auto-renew of a product, you can keep using it until the end of your subscription - then we'll delete the product and all its files.